"Based on Martin's classic OM design, with the long 25.4-inch scale, 000 body size and 1/4" scalloped bracing for powerful, balanced tone, the OM-28 John Mayer Signature Model showcases a mix of unusual elements. Both the polished Indian rosewood headplate and the African black ebony belly bridge feature inset fine-line border inlays of aluminum for a look that shows there is (as Mayer's album title points out) "Room for Squares." To match these fine line aluminum borders, the headplate showcases the classic "C.F. Martin & Co. Est. 1833" decal logo in silver. The African black ebony fingerboard is embellished with the "Triangle and Dots" international pilots' symbol for 1200 hours (high noon), replicated from Mayer's wristwatch, in colorful abalone pearl and mother-of-pearl at the 12th fret and at the 20th fret by his signature in mother-of-pearl. The OM-28 John Mayer Signature Model comes with an interior label personally signed by John Mayer and Martin Chairman and CEO C.F. Martin IV and will be delivered in a Geib style hardshell case. Mayer has suggested an edition of 404 instruments, saying "It's the Atlanta area code made famous by many rap artists and it's a beautiful looking palindrome!" 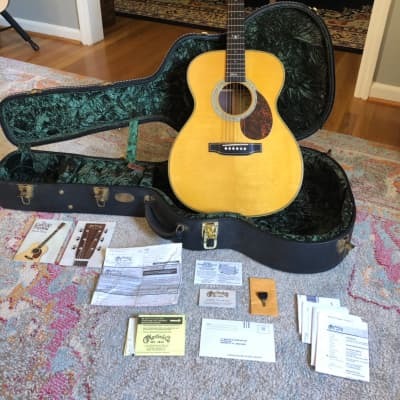 Martin will begin to take orders for this signature model immediately following its announcement until the edition sells out, with the names of participating Martin dealers to be posted on the Martin." 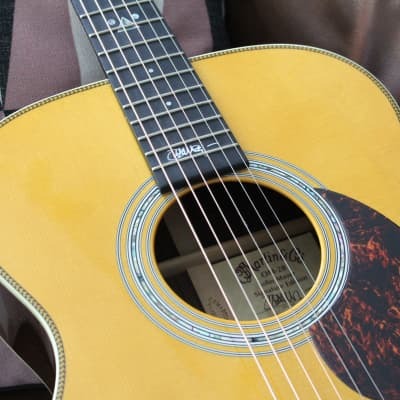 In 2006 Martin issued a second John Mayer signature guitar called the Martin OMJM, similar to the first Martin OM-28JM Limited Edition, but more affordable and more widely available. Take the MARTIN JOHN MAYER OM-28 price survey. Buy MARTIN JOHN MAYER OM-28 acoustic guitars.